Enter digits in blank cells so that every row, every column, every 3x3 block and every main diagonal contain all digits from 1 to 9. Free Diagonal or X-Sudokus as well as Even-Odd Sudokus to play online or print out. New puzzles every Wednesday! This Sudoku has been solved 72 times. 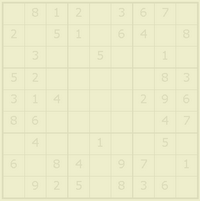 In contrast to classic Sudoku puzzles, the two diagonals of an X-Sudoku contain all numbers, too. Other names for this variation are Diagonal Sudoku, Diagonal Number Place, taikakusen nanpure, Sudoku X, Kokonotsu, or Dell's Number Place Challenger. Even-Odd Sudoku are Sudoku puzzles with colored even (or odd) cells. Sometimes this variante is called Even-Odd Number Place, Odd/Even Sudoku oder Guusuu Kisuu Nanpure. For more information about Sudoku Variations see the article of Ed Pegg Jr. and Instruction booklet (PDF) of the first Sudoku World Championships.